Goddess Parvati asked Lord Shiva to tell her why he wore beads of heads (Mund Maala). Shivji replied, saying that everytime she was born, he added one more head in the maala. On Parvati’s persistent demand to know the secret of Immortality, Lord Shiva selected a lonely place where no living being could listen to the secret. 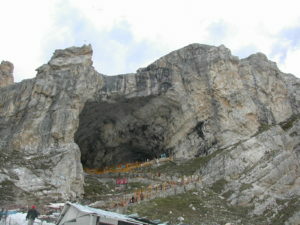 He selected the sacred Amarnath Cave. Lord Shiva left Nandi The Bull at Pahalgam (Bail Gaon). At Chandanwari, he released the Moon from his hair (Jataon). On the banks of Lake Sheshnag, he released his snakes. At Mahagunas Parvat (Mahaganesh Mountain), he left his son Lord Ganesha. At Panjtarni, Lord Shiva left behind the five elements- Earth, Water, Air, Fire and Sky. As a symbol of sacrificing the earthly world, Lord Shiva performed the Tandava Dance. Then, finally, Lord Shiva entered the Holy Amarnath Cave along with Parvati. Lord Shiva took his Samadhi on the Deer Skin. To ensure that no living being would hear the Immortal Tale, Lord Shiva created a Rudra named Kal-Agni, and then ordered Kal-Agni to set everything on fire in and around the Holy Cave.